Lower East Side: Last we checked in with Susur Lee's highly anticipated fall arrival Shang, they had slapped the place together in time for a party for Madaonna but had no floor work done, were waiting on furniture, and weren't projected to open until the now quickly approaching November 7th. But apparently the Friday projection may have been premature. 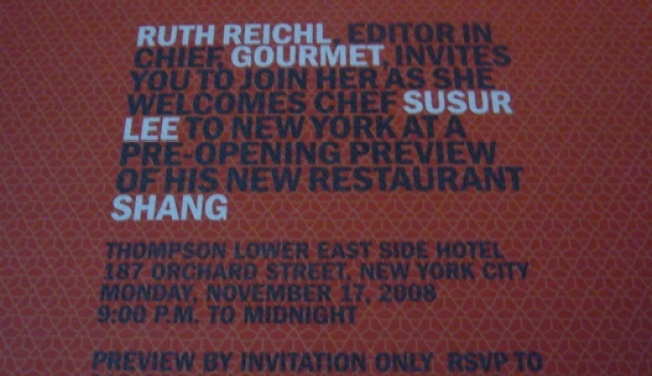 Just today the above hefty cardboard invite hit our desks, announcing Ruth Reichl is holding a "pre-opening preview party" at the restaurant ten days after that latest projection. A lovely gesture by Ruth, indeed, and a firm date like this helps prevent further delays. But it looks like the public isn't dining in this puppy until the 18th at best and realistically, not until well into Thanksgiving week.